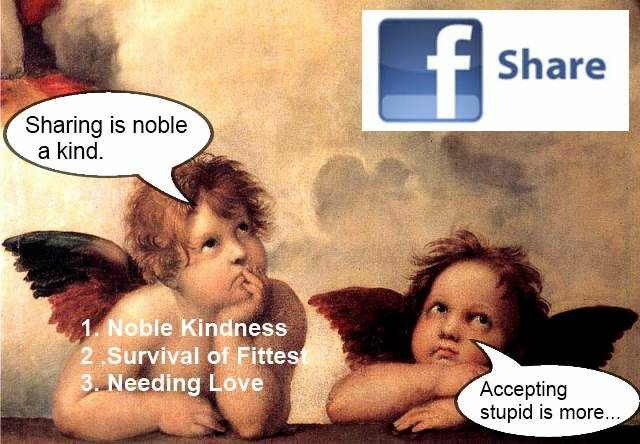 We have three motivations for why we share on Facebook: one is noble, one is survival of fittest, and the last is the need for love. So here I am, Mom, an honest man wanting to learn how to be dishonest in the best possible ways. She wanted me to leave out the honesty that would have encouraged the minister to be a better man. Facebook encourages others to be likeable. It is operant conditioning on steroids. We reward good behaviors and unfriend those with bad behaviors. This is the basic human motivation in life. We walk toward people who make us feel good and walk away from those who insult us, unless we are sort of crazy. And if my mother allowed me to be honest, I would explain that people do not have enough common sense to walk away from abuse. I am honest man in forced remission. My brain is in jail with an editor telling me 24/7 to ignore the 10 Commandments and lie, if possible. I keep my mouth shut, if not outright lie, the lies of omission. My mother was pushing dishonesty by omission, and Facebook pushes honesty by encouragement. Sharing good ideas on Facebook is noble, especially when it is the celebration of another person or business. People do business with likeable folks, and we know that if we can be very likable, we can survive, get good jobs, find good mates, and sell people something. First, we must sell ourselves and then sell the products or services. We are like a plumber who is friendly, even if he lies to make himself appear so. It just better than the alternative, a person being difficult. My mother again wants me to be quiet (dishonest) to get along with others and have them love me; we all need love. But beware: Needy people often find abusive people, not through number 1 above, but more through 2. My mother wants me to be quiet and never, accidentally or with malice, to push my fellow man down, to make him or her feel stupid. And much more importantly, my mother wants me to realize that we all have a right to be stupid, which is always human. When someone exposes something bad or weak about us, we feel small, needy or greedy. We need to allow our fellow man the right to be different. But if we are competing with a person one-on-one for survival (The baby needs new shoes! ), we need to rise up to the challenge. Facebook … the pleasure of Facebook is addictive. Here is a video explaining pleasure and the trap of pleasure. My mother would really scold me if I encouraged others to act stupid so I can be entertained. Accepting stupid is noble, but making two people argue is the work of the devil. Arguing about God’s existence is small, while trying to encourage others is big. And learning to keep my mouth shut is probably the most important lesson in life. I do try to avoid temptations. Here is a great 20 minute TED Talk in which a man explains why people wishing to thrive and survive seek pleasure, but then do too much. I am on facebook only because my kids (adults) wanted me to go on. check it every now and then, sometimes 7 to 10 days and when I travel, never. I also have not signed on to Twitter. I guess they may be good for business but I am retired and have no business.